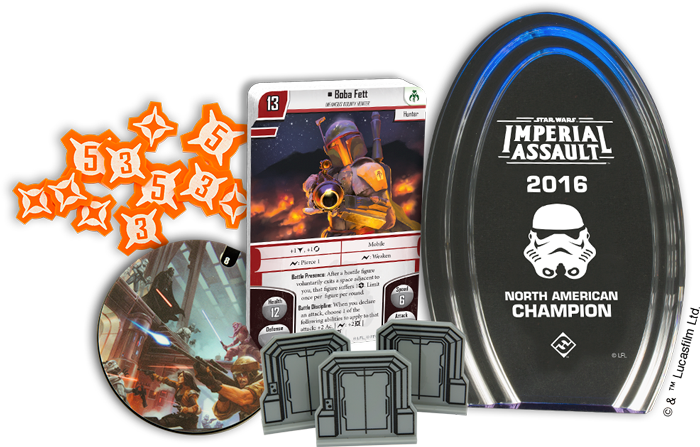 Fantasy Flight Games is excited to announce the 2016 Star Wars™: Imperial Assault North American Championship Prizes! A vital part of the Championship Series, the 2016 North American Championship will be held at GenCon Indianapolis on August 6th at 9:00 AM. With its fantastic prizes and tremendous field of competitors, the Star Wars: Imperial Assault North American Championship will be quite the proving ground for those who plan on attending the Star Wars: Imperial Assault World Championship in November. What are the Prizes for the 2016 North American Championships? Do you have what it takes to capture your bounty? Doing well at the 2016 Star Wars: Imperial Assault North American Championship will reward you with a variety of exciting prizes to show off your successes. First Place: The winner of the North American Championship receives a North American Championship trophy to show off to their family and friends, and a first-round bye at the 2016 Star Wars: Imperial Assault World Championship. A first-round bye will give you a big advantage over the fierce competition at Worlds. Top Eight: The top eight players each receive a set of acrylic door tokens. Take cover behind some of these sturdy things! Top Thirty-Two: The top thirty-two players will receive a brand new, never-before-seen plastic spot-glossed card. This card will be announced and revealed to the world at the beginning of the tournament! 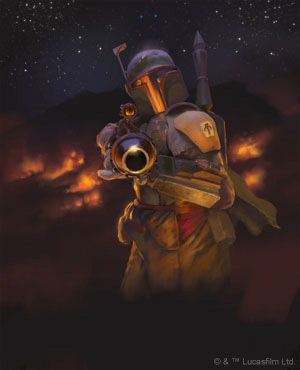 All Competitors: All players will receive one copy of the alternate art card for the infamous bounty hunter Boba Fett, and one copy of a brand new extended art card which will be debuted at the beginning of the tournament! What is the North American Championship? The North American Championship is a prestigious competitive event open to players from all over the world and are not exclusionary based on nationality or location. This prominent Championship uses the Premier Tournament Tier, reflecting the high-level competitive atmosphere of these events. It follows the National Championships in the Organized Play calendar and connects the large gaming communities that span the globe. For more information, you can read our article on the Championship Series. Over the next few months, competitors will attend 2016 North American Championships in an attempt to win these attractive prizes and become a well-rewarded bounty hunter. Don’t miss out on your chance to acquire some of these prizes for yourself and add them to your collection!